Squidward: Oh, no! Not a penny, sir. Help, somebody help us. SpongeBob: It’s just a penny, sir. It doesn’t matter. Mr. Krabs: Doesn’t matter? It’s money that makes the world go round, boy! It’s money that keeps your pants square! It’s money that gives Squidward infinate soap! Mr. Krabs: It’s money that paid for all them renovations we did! Mr. Krabs: ...scrumptious curvy cutie. SpongeBob: I see her, Mr Krabs. A Krabby Patty with cheese. The classic. Mr. Krabs: Not the sandwich, boy! The curvy cutie holding the sandwich. SpongeBob: Hey, that’s my driving teacher, Mrs. Puff! Mr. Krabs: Mrs Puff? Aw... she’s married. SpongeBob: Oh, no, Mr Krabs. She’s single. Mr. Krabs: Then what happened to Mr Puff? SpongeBob: She doesn’t like to talk about it. Mr. Krabs: Oh, what I wouldn’t give to have a lass like that on me claw. SpongeBob: Wait, I know! Why don’t I take you over and introduce you? Mr. Krabs: Oh, no, no, no, I’m too old, boy. Too hard-shelled for love. Besides, I ain't not properly dressed. SpongeBob: You wait here while I go break the ice! SpongeBob: Wait, Mrs. Puff! We’re not driving. Mrs. Puff: Oh, I’m sorry Spongebob. I didn’t expect to see you here. SpongeBob: I work here, Mrs. Puff. Want to meet my boss? SpongeBob: I’d like to introduce you to my boss, Mr. Krabs. Mrs. Puff: (Nervously) Uh, hello. SpongeBob: Wait, he’s trying to tell you something! Mrs. Puff: I don’t understand. SpongeBob: Oh, uh, I think Mr. Krabs is saying that he’d like to, uh... hit you with a rake! SpongeBob: Try to guess your weight! Mrs. Puff: Is this true, Mr. Krabs? Do you want to take me on a date? Mr. Krabs: Aye. What do you say? SpongeBob: Are you ready for your date, Mr Krabs? Mr. Krabs: I’m always ready when it comes to dating, lad! Mrs. Puff: Oh, Mr. Krabs, this dinner has been so wonderful. The coral was cooked to perfection. (Laughs) I don’t think I could eat another bite. 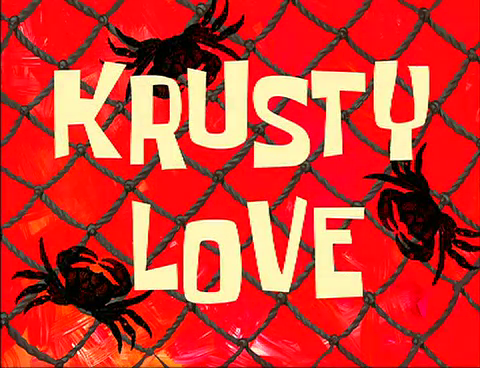 Mr. Krabs: Nothing’s too good for you, my prickly peach. Waiter: Sir? Your fancy pantsy limousine is here. Mr. Krabs: Bill? What? ONE HUNDRED DOLLARS!?! Well, this can’t possibly be correct! SpongeBob: I don’t understand, Mr. Krabs. How can you spend $100,000 in one night? Mr. Krabs: Oh, Spongebob! I couldn’t help but spend every cent I had on her! I couldn’t control myself! SpongeBob: What are you going to do? Mr. Krabs: I don’t know, boy! I’ve got another date tomorrow! I’m caught between me two greatest loves! Sweet Mrs. Puff, and the rest of me money! SpongeBob: I wish there was some way I could help. Mr. Krabs: I’m leaving you in charge of me money! SpongeBob: I don’t get it, Mr. Krabs. Mr. Krabs: You come with me on the date and make sure I don’t spend any money! (The two walk to Mrs Puff’s metalic pink house.) Now remember, we keep it cheap and go to the park. And no matter how much I ask you, don’t give me any of me money. Now, give me a dollar. Mr. Krabs: It’s me, my beautiful belle buoy! Mrs. Puff: Just a minute! Mr. Krabs: Flowers! Flowers, boy! Go get me flowers! Mr. Krabs: You can’t call on a classy lady like Mrs. Puff empty-handed! (Makes square in the air.) We’re not talking about this, boy... (Makes a triangle) Or this... (Makes the circle from earlier.) we’re talking about this! Mr. Krabs: Hurry boy, get the flowers! (Mrs Puff comes out.) Mrs Puff, you’re as beautiful as ever. Mrs. Puff: That’s funny, I thought I heard SpongeBob’s voice. Mr. Krabs: Uh... you did. He’ll be right back. He’s our personal assistant for the day. SpongeBob: Mr Krabs, I got the flowers you wanted me to buy. SpongeBob: The flowers. For Mrs Puff. Mr. Krabs: We had an agreement, boy! You’re not supposed to spend any of me money! Mr. Krabs: For you, Mrs. Puff! Mrs. Puff: Oh, flowers! How thoughtful! Mr. Krabs: And here’s a box of chocolates! (He holds out an empty claw.) Spongebob, where are the chocolates? SpongeBob: I bought the biggest box they had! Mr. Krabs: Buy, buy, buy! Spend, spend, spend! Is that all you can think about? Mr. Krabs: Here’s those chocolates I bought for you. What are we doing today, Mrs. Puff? Dinner? Dancing? A trip to the moon? SpongeBob: We’re just going for a walk in the park, remember? Mr. Krabs: Mrs. Puff needs a sun hat, Spongebob! Mr. Krabs: The sun’s beatin' down on poor Mrs Puff’s head! Mr. Krabs: There’s no time for suggestions, boy! Go buy a hat! Mr. Krabs: Today! Don’t worry, Mrs Puff! I’ll save you! (Places a barrel on Mrs. Puff's head.) Spongebob, hurry! Mrs. Puff: Uh, thank you. But you didn’t need to buy one. I have a hat in the closet. Mr. Krabs: Didn’t need to buy one? (He turns his head around like an owl to face SpongeBob.) Did you hear that, boy? We didn’t need to buy a hat! Aren’t you supposed saving me money? SpongeBob: I’m trying, Mr Krabs! But you keep telling me to buy things for Mrs Puff! It’s all very confusing. Mr. Krabs: Spongebob, I’m sorry. This is my fault. I’m not thinking clearly. I’m making a sailor’s promise, boy. From this moment on, I won’t ask you to buy anything for Mrs Puff! Mrs. Puff: Are we going to the park soon? SpongeBob: Cheer up, Mr. Krabs! Here’s that washing machine you wanted! Mr. Krabs: Cheer up? How can I cheer up… when you’re spending all me hard-earned cash? SpongeBob: See! You just did it again! Mr. Krabs: Lad, I can’t help it if you’re loose with other people’s money. Do you think Mrs. Puff will need a dryer to go along with that?